I missed you terribly and wanted to share what I was experiencing. You don't have to create memories on a digital camera 24x7. Telling stories with your friends and family is WAY super cool when you do these face to face. Definitely scheduling my online "social media" times so I can be more efficient. This is totally my calling and need to be connected with you as I love doing what I do! How about you? How did you survive? I saw your hashtags, so thanks for joining me and I hope it gave you some "me time." HOLIDAYS!!!! Holidays! H o l-i-daaaaays! Man! I love holidays. I love to travel, I love meeting people, eating, exploring, listening to bands, adventures, going to events, playing with the kids, outdoor activities, just relaxing with the family and of course escaping for a Mum pamper session at a local Endota Spa for a couple of hours. So we got to do some pretty amazing things from surfing, swimming, walking, skating and the kids absolutely loved slack lining. It's amazing core stability and balance benefits are an awesome way to keep healthy and fit over the holidays. It's totally cool too if you have a BBQ with friends or a team building session in a park somewhere, you will have sheer fun just seeing everyone's determination to make it to the other end. Not to mention many laughs! Super cool finding these park gyms along the coast. Had to stop by and do some bench presses while the kids ran straight to the beach. These are such a great idea, you can meet your friends in your local community or we could do a meet up and all workout together. Now that would be fab! We kept this pretty basic. Holidaying with 4 kids can sometimes blow the budget so we tend to shop at our local supermarket and ensure we have an apartment with cooking facilities. Yeah, yeah I know. It doesn't leave me much of a holiday as I am still doing my regular cooking gig but hey! Lucky I love food huh? Nothing beats the view and sound of the waves so it wasn't all that bad. Breakfast was typically porridge with fruit, smoothies or muesli with yogurt. Other nights we would make grilled chicken salad, tuna taco's (I used salad cups) Oscar made a spaghetti Bolognese as he wants to feature on my new You Tube channel, bless him. He saw my goals list for this year to collaborate with Jamie Oliver and his Food Tube team, so he's riding the wave with me. Method Marinate chicken with crushed garlic, salt and pepper and stand for at least 1o minutes. Heat oil in fry pan and cook until golden brown (we had that electric pan so use whatever works, even BBQ grill the chicken). Wash salad leaves, mix olive oil with mustard, season with S&P and squeeze lemon juice. Done in under 15 minutes and super fresh! 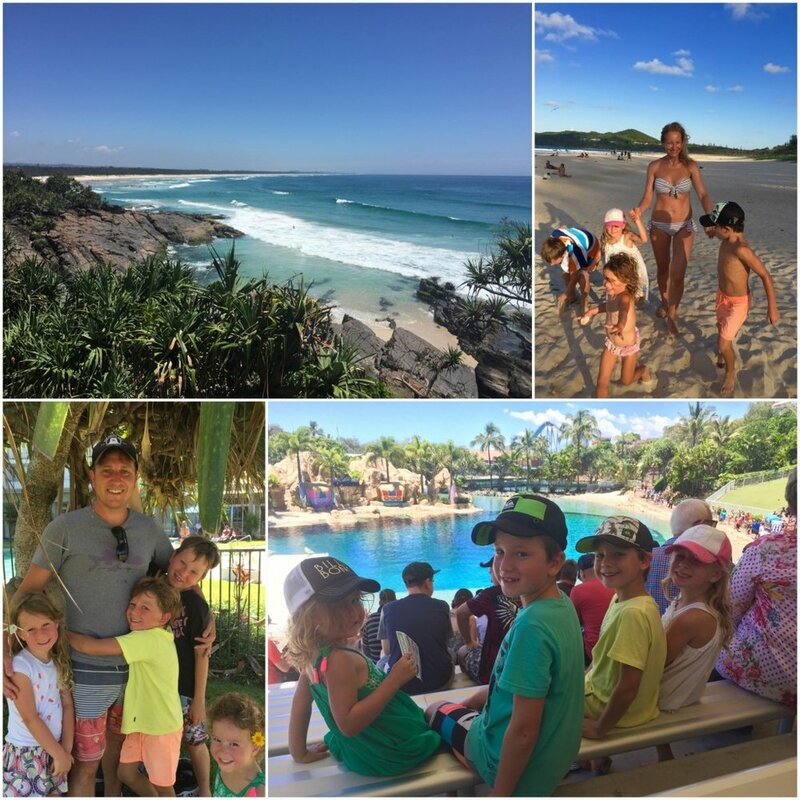 The weather up in Noosa and Sunshine Coast was sublime, back home in Victoria there was torrential rain and we say this every year, but we can't wait to move up North! We travelled over 5,000kms with 4 kids and I won't say it was smooth sailing all the way but all in all we had such a great road trip. Did a little shopping and met up with my amazing stylist Stevie who once again nailed my summer look. Bringing a glamorous beach vibe into this highly versatile day look is the key to looking effortlessly cool on a hot summer day. Putting natural fabrics and materials together to make an earthy statement, yet giving it a refined edge by drawing attention to their contrasting textures for a sense of quality and craftsmanship. The digital print not only offers intrigue and modernity, but paired with bold accessories gives you the freedom to take this outfit from beach to city in an instant. So who's ready to go away on a "Trip Of A Lifetime?" I have one coming up which will BLOW YOUR MIND. Stay tuned and share this post, as I partner with MWorld who are offering a trip you will never forget!